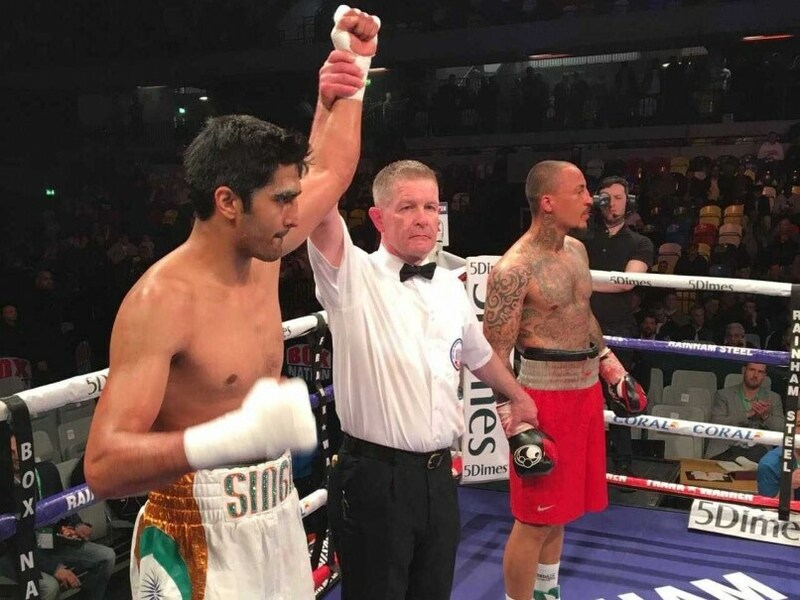 Vijender Singh earned his fifth consecutive victory in professional boxing in London on Saturday evening by defeating experienced Frenchman Matiouze Royer by a Technical Knockout (TKO). The bout only lasted five rounds. Relive the highlights of Vijender Singh vs Matiouze Royer bout here. Vijender Singh was red hot at the Copper Box Arena in London where he had boxed as an amateur. On Saturday night, the former World No. 1 destroyed a 44-bout veteran Frenchman in five rounds, dominating the entire match. 23:20 hrs IST:Â Vijender's next bout is on May 13 before he fights for his WBO Asia title in India in July. Vijender Singh needed only five of the six rounds to defeat Matiouze Royer of France. 23:14 hrs IST:Â Vijender can't wait to fight at home. "It will be a home coming fight! I have invited from the prime minister to Bollywood stars to attend the match. It is going to be a great spectacle and will be a new era as it will be the first time in India," said the Bhiwani born! 23:12 hrs IST:Â "Royer is a good fighter and has boxed with some good ones in all these years. I discussed with the coaches and planned this fight so it is going right for me. Pro is totally different from amateur boxing. I am a little bit more experienced in pro boxing now so that is good," saidÂ Vijender after the win. 23:11 hrs IST: Royer pats Vijender on the back to congratulate him. The 2008 Olympic bronze medallist thanks him and goes on to pose for some photos! 23:10 hrs IST: Royer's face was completely red by just the third round. 23:09 hrs IST:Â What a win! He did not even have to go the distance. Finished the bout in only five rounds against such an experienced opponent! 23:07 hrs IST:Â Doc and umpire discuss and the umpire has signalled it! VIJENDER WINS!!!! Another by technical knockout! 23:06 hrs IST: Vijender has really hurt Royer. The Frenchman needs attention from the Doc ringside! 23:05 hrs IST: BANG!!! Vijender's punch had Royer on his knees! That was right on his eye! 23:04 hrs IST: Two more round to go! 23:02 hrs IST: Vijender is definitely the aggressor! And he also manages to evade jabs from Royer, who has a very closed guard! 23:01 hrs IST: Vijender's punch there knocked out the Frenchman's gum guards! That is surely a point! 23:00 hrs IST: End of three bouts! Three more to go! 22:59 hrs IST: Royer's face is red. Vijender's hooks cleared Royer's guard and landed exactly where the Haryana pugilist would have wanted them to land. 22:58 hrs IST: This time it is Royer who jabs Vijender in his ribs! That must have hurt! 22:57 hrs IST: Third round!!! 22:56 hrs IST: That was a crucial jab from Vijender and Royer's left eye is bleeding. Way to go for the Indian! 22:55 hrs IST: Second round begins! 22:52 hrs IST:Â A very slow first round to start with. Vijender landed a couple of body blows but more or less a very slow round to start with. 22:51 hrs IST:Â Slow, careful and jittery start from both. Vijender landing a few punches but Royer's guard is up! 22:50 hrs IST:Â The six round bout has begun! 22:49 hrs IST: Both pugilists look very serious! 22:48 hrs IST: And in white shorts, from India Vijender Singh!!!! 22:47 hrs IST:Â Royer is in the red colour. 22:45 hrs IST: IT IS TIME! 20:40 hrs IST: Vijender's last fight was in March and to know what happened then read here. 22:30 hrs IST:Â Vijender's fight will take place in a few minutes following a couple of bouts of other boxers. Done with weigh in &a face-off with Matiouze Royer, now time for real action tomorrow at Copper Box Arena.???? 22:29 hrs IST:Â We are just minutes away from the bout! 22:26 hrs IST: Royer hails from Bayonne in south west France and has had 14 KOs in his career! 22:22 hrs IST:Â Royer will be making his second appearance in UK tonight. 22:20 hrs IST:Â Though Vijender has won all his previous four fights via Technical Knockouts (TKO), his opponent tonight is a more experienced boxer. Royer is a veteran of 44 fights and has only been stopped twice in a career spanning over seven years. 22: 17 hrs IST: The bout will be fought at the Copper Box Arena in London. It will be a six round fight! 22:15 hrs IST: India's boxing sensation Vijender will today take on French pugilistÂ Matiouze Royer in his fifth professional bout! 22:12 hrs IST: Hello and welcome to one more fight night. Vijender Singh has been undefeated in his previous four Pro-Boxing fights. Matiouze Royer is known as a French terror. He talks and punches with equal vigour. And he has the stats to back himself. A veteran of 44 professional fights, Royer has only been stopped twice in a career spanning over seven years. With three knockouts under his belt, Royer has thrown India's pin-up boy Vijender a serious challenge. The mind games started after Friday's weigh-in at the Copper Box in London. "I know I've got the beating of Vijender already; I saw it in his eyes. He looked scared to me. There's no doubt in my mind I'll knock him out tomorrow night. There's a lot of hype around this guy and I can't wait to be the one to put him in his place," said Royer. Vijender is not one to throw in the towel easily. With four straight wins in his first year as a pro, the 30-year-old Indian has shown the skills and the intensity to match overseas boxers. Saturday could be his biggest test. "Saturday night is going to be tough, Royer has 250 gruelling rounds under his belt compared to my 9. I know he's capable of mixing it up and making life difficult for me but he won't have a reply for my knockout power," said Vijender. A win in the six-round contest will surely take Vijender to the next round of professional competency and possibly a dream match-up with British star boxer Amir Khan.